The kākāpō (night parrot) is one of New Zealand’s unique ‘treasures’ and with only 124 known surviving birds. It is listed internationally as a critically endangered species. Large, flightless and nocturnal, the kākāpō is an eccentric parrot which can live for decades. It is not closely related to other parrots and, in fact, has a combination of biological features not shared by any other species. It is the only representative of a unique sub-family, Strigops habroptila, and the softness of its plumage is represented in the second part of that scientific name. With mottled moss-green feathers, camouflage is the bird’s main form of defence. By the 1970s, only a few isolated birds were known to exist in Fiordland, South Island. A survey of Stewart Island in 1977 found about 200 more birds but they were rapidly declining through predation by feral cats. Following translocations of all the remaining kākāpō, they are now managed by the Department of Conservation on three offshore islands: Whenua Hou (Codfish Island) near Stewart Island, Anchor Island in Fiordland, and Little Barrier Island (Hauturu-o-Toi) near Auckland. 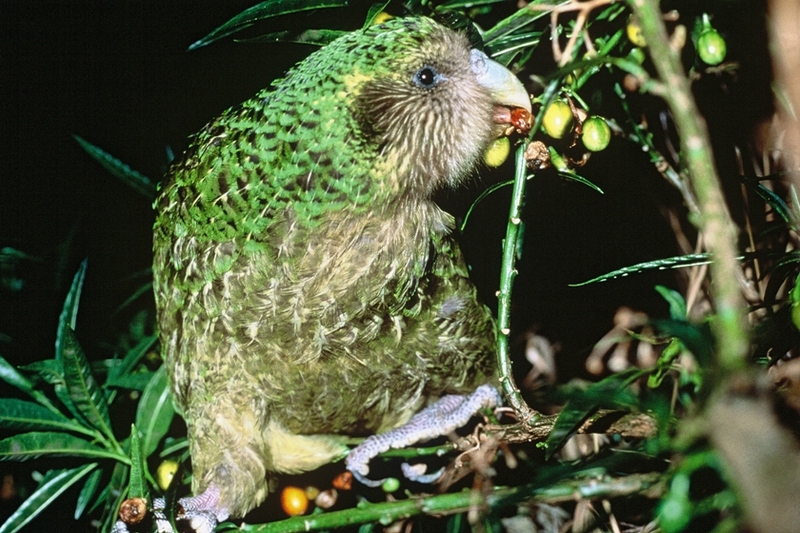 Kākāpō are the heaviest parrot in the world. Males can weigh over two kilograms. Unique among land birds, it can store large amounts of energy as body fat. Kākāpō is the only parrot to have a 'lek' mating system: males compete for 'calling posts' specially dug-out bowls in the earth and call ("boom") each night in summer months for a female. The male’s low-frequency mating boom travels over several kilometres. It is the only parrot to have an inflatable thoracic air sac. Kākāpō breed every two to four years. A Kākāpō can walk several kilometres in one night. Although it cannot fly, it is good at climbing trees. The birds are herbivores and eat variety of foods such as roots, leaves and fruit . Kākāpō once lived from near sea level to high in the mountains. Possibly as defence against its ancient predator - the giant eagle - the kākāpō became nocturnal and learned to remain still ('freeze') at times of danger.